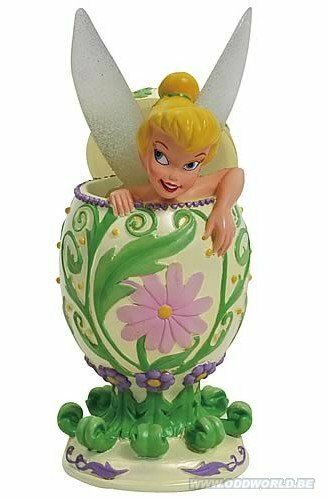 As ornate as the fairy would herself expect, this resin Peter Pan Tinker Bell Peek-A-Boo Egg Statue will make a great decorative piece in your home! Originally written as an actual "tinker," someone who literally tinkers with and mends pot and kettles, it's fitting that Tinker Bell coyly rests just above the vase on this Peek-A-Boo Egg Statue. The statue stands 5-inches (13 cm) tall, and features precise details like the lovely flow of the flower roots at the bottom of the egg statue and the varied coloration on Tinker Bell's wings.